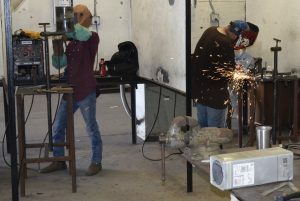 (WACO) – Texas State Technical College is betting you not only get a job, but that you will get a great-paying one when you graduate. That is why TSTC offers a Money-Back Guarantee on its most in-demand programs. If you do not get a job, you will get your tuition back, guaranteed. TSTC’s Money-Back Guarantee began in November 2016 and is for students pursuing associate degrees in Diesel Equipment Technology, Electrical Lineworker Technology, Electrical Power and Controls, Instrumentation Technology and Welding Technology. The technical programs were chosen because they are in high demand in Texas. So far, 51 students statewide are enrolled in the initiative, said Kacey Darnell, executive director of TSTC’s Career Services and Talent Management. “Even though the programs in the Money-Back Guarantee have high job placement, signing up for the Money-Back Guarantee is like having an insurance policy, and it will cost participating students nothing,” Darnell said. Students in these programs are eligible to sign up with campus Career Services and Talent Management representatives. Students who are not hired in their field within six months after graduation may be eligible to get a refund for their time at TSTC. Cody Russell, 29, of Dublin, Texas, is pursuing dual associate degrees in Electrical Power and Controls and Instrumentation Technology. He said the Money-Back Guarantee was like a security blanket. He is scheduled to graduate with both degrees in December 2019. “Anything after the fifth semester and if you are double-majoring, start consulting with Career Services,” Russell said. Michael Bowers, TSTC’s vice president of student learning, said the students who sign up for the initiative can have access to lessons on resume writing, interview techniques and other employment skills. Robert Lovelace, a TSTC master instructor and statewide department chair in the Instrumentation Technology program, said there are at least 90 new students in the program this semester at TSTC in Waco. “The students are advised of the Money-Back Guarantee program in the registration process,” Lovelace said. He said several instrumentation jobs in the oil and gas industry are along the coast, in West Texas and the Panhandle. Graduates who pursue the field can become electrical and electronics engineering technicians, and commercial and industrial electrical and electronics repairers. This entry was posted in All TSTC on September 21, 2018 by Daniel Perry.